192 people in our community are currently praying with you. The language of Jesus is love. Thru the trials and the triumphs of life. The language of Jesus is love, it tells the greatest story ever told. But my words would just get in your way. There's a language that's learned by the Spirit. When heaven's love is shared. For the language of Jesus is love. It tells the greatest story ever told. Lord, I ask you to inspire me to encourage others by what I say and do today. God and Father of all people, never let me look down on others or make anyone feel inferior. Lord, show me how to live today with genuine concern for others. In expressing my care, may I show people that they are valued, loved and appreciated for who they are. In all your ways acknowledge Him and He will make your paths straight. And when you pray, you must not be like the hypocrites. For they love to stand and pray in the synagogues and at the street corners, that they may be seen by others. Truly, I say to you, they have received their reward. This is the first half of Christ's famous teaching on prayer, where He gave us the Lord's Prayer. The overall theme is simply this: if we pray with sincerity, we pray successfully. Two major problems slow us down. The first, much like charity (discussed Saturday), is that we do it in private for God, rather than in public, so that other people will think better of us. The second (which we will cover tomorrow) is to pray with our hearts, not our lips. The Jewish system of prayer made ostentation very easy. Jews of the day prayed standing, with hands stretched out, palms upwards, and with their heads bowed. Prayers were required to be said in the morning and evening, at a specific time, wherever one might find himself. it was easy to make sure one was on a street corner, or crowded city square, or on the steps of the synagogue, and there to pray loudly and at length, so that all might admire the person's exceptional piety. It was easy, in a word, to put on a show. When one prays in private, the temptation is completely removed. At least part of our prayer life must be private, so that we can develop a one-on-one relationship with God. This brings up another benefit to private prayer; God is utterly understanding, so we can say things in private we might not want others to hear. We can pour out our true heart. Another important facet of private prayer is that, in quiet solitude, we can listen better. The voice of the Spirit can be quiet and subtle. In fact, God can work in our heart without words being involved at all. 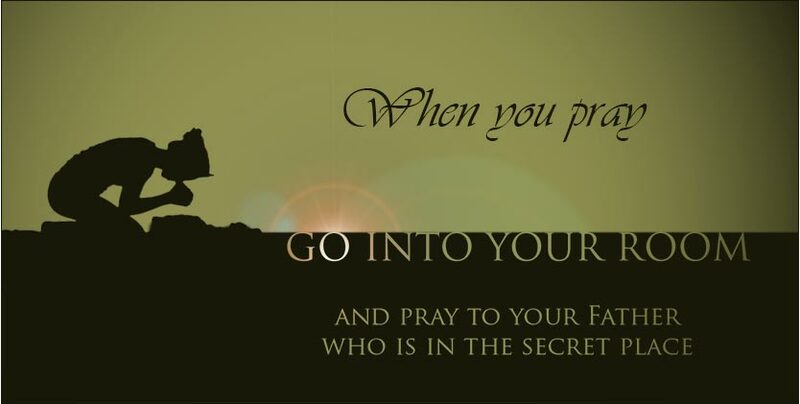 We pray in secret, not because we are hiding, but because it is necessary to have a direct, singular relationship with God. One of His most wonderful attributes is His limitless intelligence; He can count every hair on our humble head, know us better than we know ourselves. Psalm 119:105: Your word is a lamp to my feet, and a light to my path.